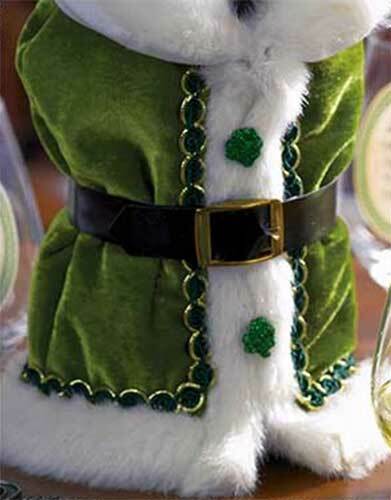 Irish wine bottle covers make a fun presentation gift and will do double duty as a decoration on St. Patrick's Day or for any day. These Irish bottle covers are suitable for any tall bottle including wine and whiskey. Several of our Irish wine bottle covers are in the form of a mini t-shirt that feature an Irish witticism and all the covers are graced with shamrocks. 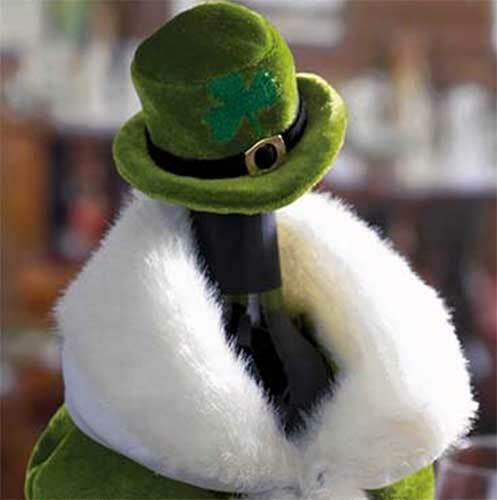 Irish wine bottle cover features an green coat and hat with shamrocks that was either borrowed from a leprechaun or an Irish Santa. Irish wine bottle cover features a mini t-shirt with shamrocks that says, Irish at Heart. Irish bottle cover features a mini t-shirt with shamrocks that says, Kiss Me I'm Drunkish. Irish wine bottle cover features a mini t-shirt with shamrocks that says, Here's to the Irish. Irish bottle cover features a mini t-shirt with shamrocks that says, 100% Irish. Complement these bottle covers with one of our Irish wine corks and maybe add some Irish wine glasses too. These Irish bottle covers will make outstanding St. Patrick's Day gifts or you may also use them as St. Patrick's Day decorations.